Tampa Bay, FLA (August 01, 2018) – Sea Dog Brew Pub in Treasure Island is hosting a Summer Sweepstakes and five lucky winners will take home prizes. 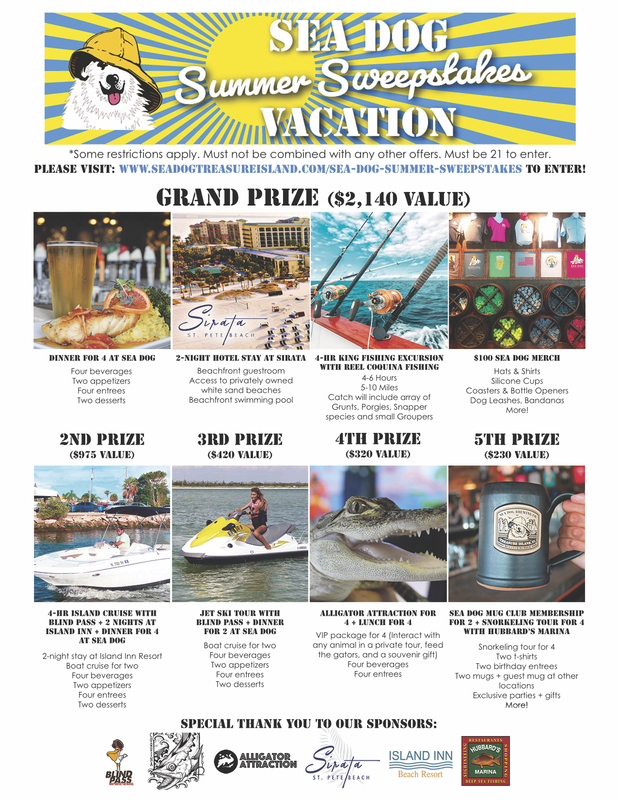 The sweepstakes includes five prize levels in partnership with the Sirata Beach Resort, Island Inn Resort, Blind Pass Boat and Jet Ski Rental, Reel Coquina Fishing, Alligator Attraction, and Hubbard’s Marina. The public can enter the contest by signing up at https://bit.ly/2LH8qcc starting Wednesday, August 1st throughout the month of August with winners announced via email on Friday, August 31st. The Sea Dog grand prize giveaway features a 2-night hotel stay for four at Sirata Beach Resort and dinner for four at Sea Dog. The Sirata is located on St Pete Beach near shops, restaurants, and more. The hotel stay includes a beachfront room, access to miles of privately owned white sand beaches, access to the beachfront swimming pool, and on-site parking. Dinner for four at Sea Dog Brew Pub will offer winners a 3-course meal with four beverages, two appetizers, four entrees, and two desserts. This prize package also features a Kingfish fishing trip donated by Reel Coquina Fishing. The trip is 4-6 hours, 5-10 miles from the intercoastal, and winners can catch fish such as grunts, snappers, porgies, and small groupers. Sea Dog is also gifting a $100 merchandise credit for winners to purchase all kinds of pieces such as hats, shirts, cups, dog accessories, and more. The second place prize includes a 2-night hotel stay at the Island Inn Resort and a 4-hour boat cruise for two donated by Blind Pass Boat and Jet Ski Rental located in St. Pete Beach. Winners of this prize will also receive a dinner for four at Sea Dog Brew Pub which includes four drinks, two appetizers, four entrees, and two desserts. Third place prize winners receive a 2-hour jet ski adventure for two from Blind Pass Boat and Jet Ski Rental. The prize also includes a dinner for 2 at Sea Dog with two beverages, one appetizer, two entrees, and one dessert. The fourth place prize includes a VIP experience for four at Alligator Attraction in Madeira Beach. The package features a private tour with an interaction with any animal, gator feeding, and a souvenir gift. This prize level also includes lunch for four guests with four drinks and four entrees. 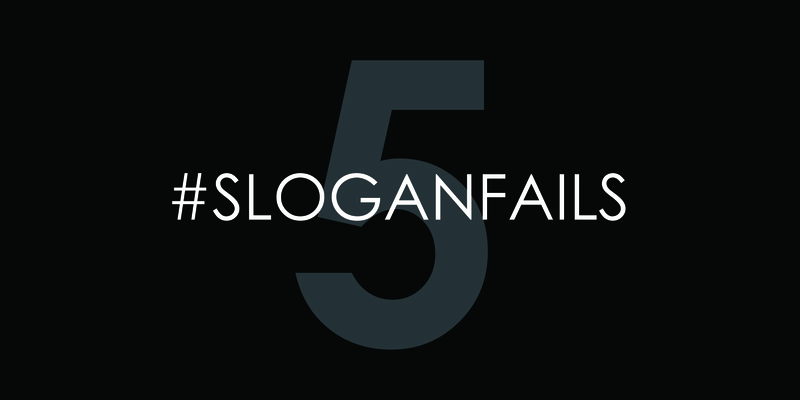 Fifth place prize winners will receive two Sea Dog Mug Club memberships. Each membership consists of a mug and guest mug at other Sea Dog locations, a t-shirt at sign up, a birthday entree, exclusive access to parties and an annual gift, points towards free food, and special pricing on Sea Dog crafts. The prize also includes a snorkeling tour for four atHubbard’s Marina. Sea Dog Brewing Co. was founded in 1993 on the coast of Maine. Known for their English style brewed beers, the company has expanded with locations in Maine, New Hampshire, and Florida. Each brew pub features a full menu of handcrafted ales and creative pub fare. The Clearwater location offers locally crafted Brewer’s Choice beer and tours inside the 20-barrel brew house. Sea Dog Brew Pub in Treasure Island is a 10,000 sq. ft. waterfront restaurant featuring craft beers, games, and a gulf-inspired menu. For more information, visithttps://seadogtreasureisland.com/ or call at 727.954.7805.